This was among the earliest paintings which I did. It was a picture of a clay jar containing black vinegar and garlic. On the wall is a surgical mask. This painting was done during the SARs epidemic. 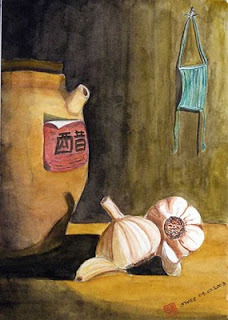 The Chinese believed that taking garlic and black vinegar would boost the immune system to keep SARs away. I did this to record the event as well as to study the light and shadow play on the objects. 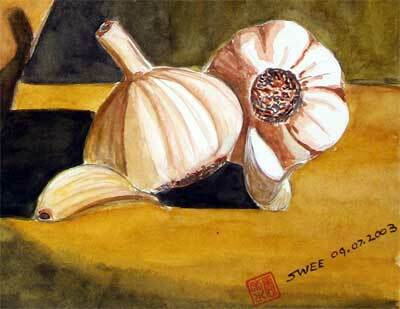 I used thick watercolour (not gouache) to capture the textures of the objects.